This garden should be a fun one! So the idea behind this garden is actually a combination of two ideas. 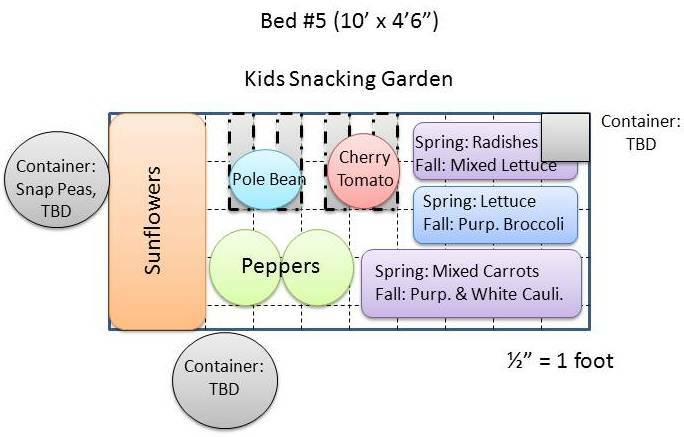 I had the idea of planting a “snacking” garden, planted exclusively to vegetables that can be used for eating raw as a “snack.” One of our Master Gardeners wanted to plant a garden geared towards kids. So…we combined the two ideas! I think it will be a lot of fun! We have been doing the cattle panel trellises in the raised beds for 3 years now, but for this garden we will be trying something different again. We are going to try putting a trellis over the walkway between beds 4 and 5. It will be quite an experiment! I hope it turns out! Sunflowers: We will be planting 3 varieties, ‘Teddy Bear,’ ‘Aztec Sun,’ and ‘Valentine.’ These are a variety of heights and colors. Tomatoes: We will have two cherry tomatoes, one red and one gold. The varieties are ‘Super Sweet 100’ and ‘Golden Honey Bunch.’ We will probably be doing some heavy pruning to keep them controlled on the trellis, so that will also be a new experience. Beans: A lot of people do not have success with pole beans here, but one of our Master Gardeners has had good luck with ‘Emerite’ filet pole beans, so we will be giving those a try. Cucumbers: We will be revisiting the white ‘Salt and Pepper’ cucumbers that we had in the Vertical Garden last year. Peppers: Our pepper plants will be the red and yellow ‘Lunchbox’ peppers. In the spring, we are planning to have some baby romaine lettuces and mixed color carrots and radishes. In the fall we will revisit the lettuces as well as try out some purple and white cauliflower varieties and the ‘Purple Peacock’ Sprouting Broccoli. We are also going to try some fun containers near the garden, one with sugar snap peas and the other with perhaps a tomato or a bush pumpkin or melon. This should be a fun garden to photograph this summer! Posted on January 23, 2013, in Garden Planning and tagged beans, broccoli, carrots, cauliflower, cucumbers, garden planning, garden plans, kids, kids in the garden, peppers, radishes, salad greens, Tomatoes. Bookmark the permalink. 3 Comments. This is such a great idea! Do you think these plants would be good for beginning (or “brown thumb”) gardeners? I’ve had a few years in a row with poor results – I don’t know if it’s me, my yard, the weather, or what, but the idea of a kids’ snacking garden almost convinces me to try again. Carolyn, the last two years I would blame the weather over almost anything else! But…no guarantee this year will be better. As for the specific varieties, most of them are new to us as well, so I have no idea how they will do. I do know that cherry tomatoes typically perform better than larger tomatoes under trying conditions. That has definitely been my experience.